Sivananda Yoga is one of the most widely practiced approaches to yoga. It is taught at nearly 80 Sivananda locations (ashrams, yoga centers, and affiliated centers) throughout the United States and the rest of the world. More than 15,000 teachers of yoga throughout the world have been trained in this approach to yoga. Typically, Sivananda Yoga is taught in several courses that progress from beginner to intermediate and advanced. Beginners Yoga, Part I, is a five-session class that focuses on proper exercise (basic yoga postures), proper breathing, and proper relaxation. Each class is 60 minutes in length. 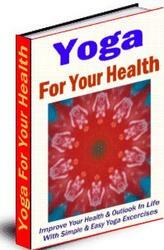 Instruction is continued in Beginners Yoga, Part 2, which teaches the rest of the basic yoga postures and exercises, and introduces the principles of proper diet, positive thinking, and meditation. This course is also a five-class series, with each class lasting 90 minutes. Additional classes are offered in intermediate and advanced yoga postures, as well as in meditation. Once students have completed the two beginners' courses, they are free to attend open classes, which are typical of a Sivananda Yoga class. These classes last for 90 minutes and follow a prescribed protocol. They begin with approximately 20 minutes of two basic breathing exercises. Breathing exercises are followed by more than an hour of physical exercises, which are comprised of 12 basic yoga postures. Each class concludes with a long, deep relaxation. In addition to instruction in classic Sivananda Yoga, a variety of classes are frequently available that are tailored to specific needs. For instance, Gentle Yoga, performed in chairs, can be especially helpful for seniors and the physically impaired. A Headstand Workshop can help you to develop stability in performing headstands while overcoming fear. Yoga for Kids presents yoga to children 7 to 13 years of age. In addition, a wide range of classes and workshops are offered in vegetarian cooking, yogic cleansing practices, yogic breathing, and other topics related to health and well-being.